Updated for v.3.5, but a whole lot more than the original Kingdoms of Kalamar Player's Guide. Publisher's blurb: "This is it - the definitive rulebook for the D&D: Kingdoms of Kalamar campaign setting, and a must have for players and Dungeon Masters of any D&D (v3.5) campaign. 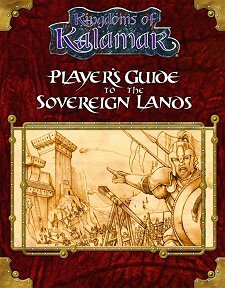 Not only is the Player's Guide to the Sovereign Lands loaded with expanded and updated material, this 275-page searchable PDF supplement also includes a vast amount of new background details and game mechanics!"